That one site that doesn't reset at Midnight (it only accepts fresh votes after 24hrs) is a pain. When I'm voting every day, that's the one I sometimes miss - Can't be on the computer often enough, sadly. Best of luck to everyone voting! 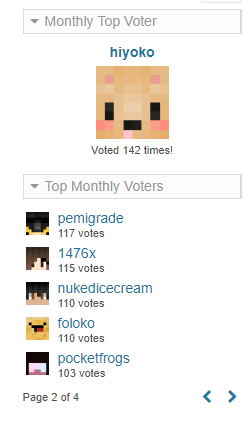 Congratulations to the April Top voters who all reached over 110 votes. 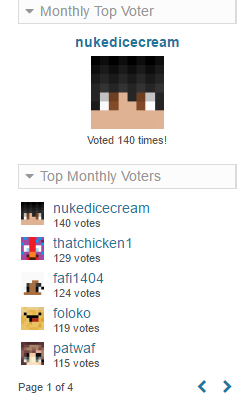 Nuked wins 1st with the most votes for the month. Prizes will be given out shortly. May top voter prizes were given out on the 1st of June. zombie and skele horses would be great! I'd wanna see Shulker spawn eggs. Non-VIPs could use them to flyyyy. (06-16-2017, 10:06 AM)DrRadiant Wrote: I'd wanna see Shulker spawn eggs. Non-VIPs could use them to flyyyy. And then fall to the ground and die. I agree. Shulker spawn eggs would be nice, but not because they make you fly, because of their loot. PemiShop- Buy and sell items! PemiSlime - $900 for life, two chunk AFK slime farm! Paint - Free easels and dye for all! Court - For all your minor disputes! Congratulations to the top voters of June. With hiyoko and kimitu winning the top vote. 7 others also won the secondary prize with 110 votes and will receive in-game money/vip1 + 2 parrot eggs + 2 elder guardian eggs. Next months egg prizes are being chosen so keep sending suggestions! (07-02-2017, 03:53 AM)frost Wrote: Congratulations to the top voters of June. 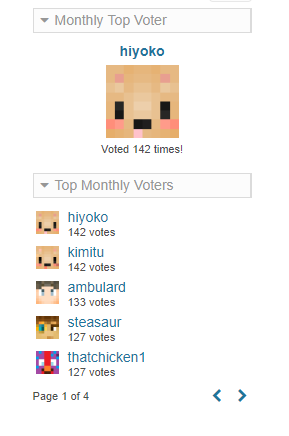 With hiyoko and kimitu winning the top vote. 7 others also won the secondary prize with 110 votes and will receive in-game money/vip1 + 2 parrot eggs + 2 elder guardian eggs. Next months egg prizes are being chosen so keep sending suggestions! Any possibility of getting Evoker eggs? Not only the Totems are nice but the Evokers themselfs would look as decoration... until it stabs to the back.